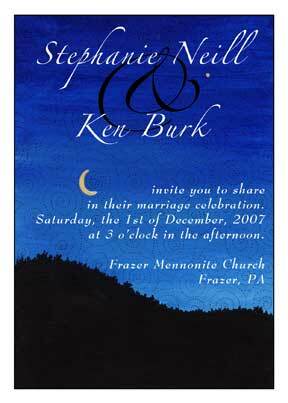 Yes, I do make wedding invitations and announcements! 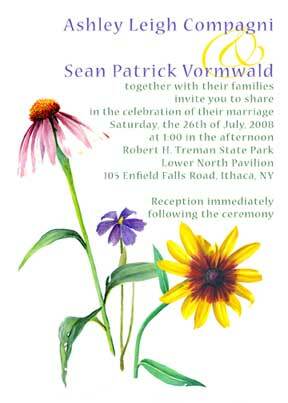 It has been my pleasure to shepherd many happy couples through the process of creating an invitation that reflects their special occasion. 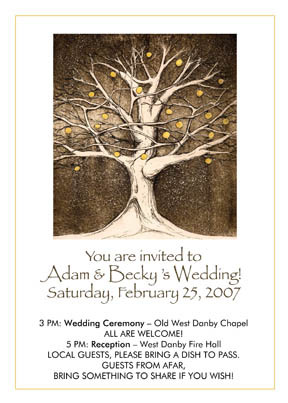 Above you will see several image options to choose from, and using that base we can work together to create a beautiful invitation for you. 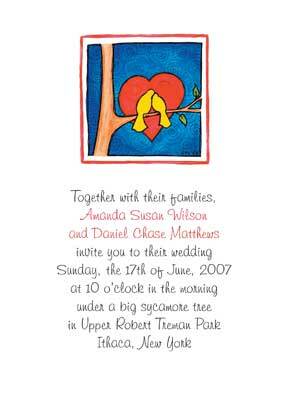 Also good for baby announcements and anniversary parties and other events worthy of mailing a card. 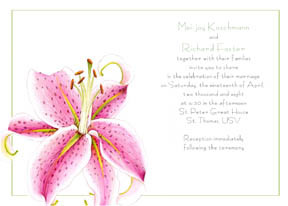 All designs are available on beautiful white or ivory linen cardstock with matching envelopes. 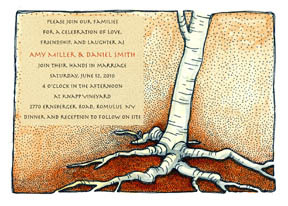 I can also create a Quaker wedding certificate or ketubah for you, please send me an email to begin that conversation. All couples are welcome here. 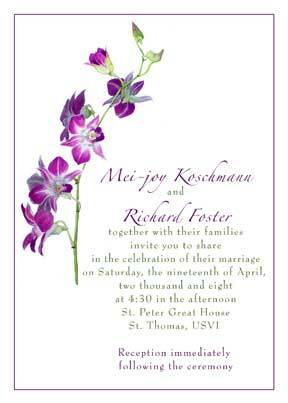 • Each set of a 5x7 single-sided invitation, plus envelope and RSVP postcard is $3.00. 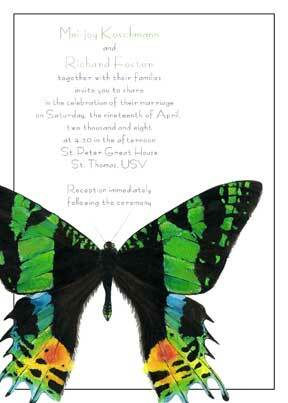 This includes all design fees. 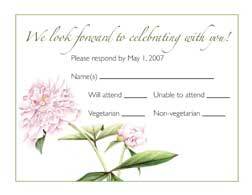 • Thank you cards: wedding clients get a special deal of $1.50 each for blank thank you cards, $2.00 if there is custom printing inside. Please choose from the above 12 designs, and contact me with your text to begin the process. 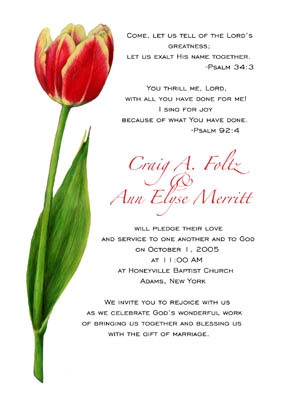 I will work with you on fonts and font colors and other fine points (we can do this completely over email, so couples from far away are welcome). 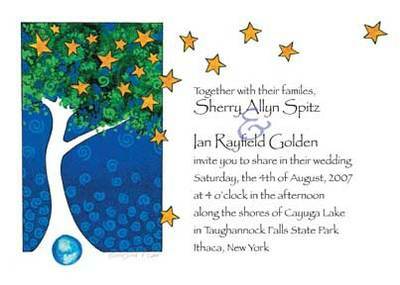 The entire process, including printing time, takes approximately 2-3 weeks. 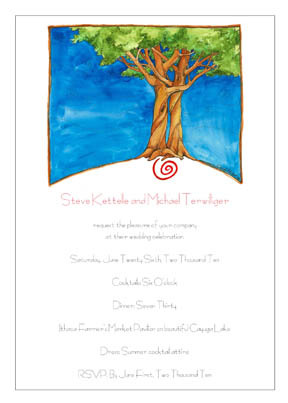 Please note that I no longer create custom wedding artwork, but will gladly work with any of my existing images if something else has caught your eye.